A hand sanitizer or hand antiseptic is a supplement or alternative to hand washing with soap and water. 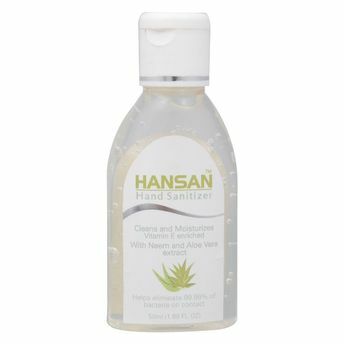 HANSAN by Terrai contains Neem extract that is hard on germs and helps keeps hand bacteria and germ free. But the Aloe Vera extract ensures its gentle on the hands, leaving them feeling moisturized and non-sticky. This high quality formulation is also enriched with Vitamin-E as a skin conditioner. Regular application provides continual antimicrobial protection.